There has been a steady increase in the number of private cars in Hong Kong too but this doesn’t coincide with more parking lots and highways. Instead of building more car infrastructure for the future, we should look more into ride sharing for the future. There is some pretty groundbreaking stuff out there though, particularly with driver-less technology. One example is from IDEO. They came up with the concept called the Future of Mobility. I was blown away with some of their ideas, particularly with the concept of the communal car. 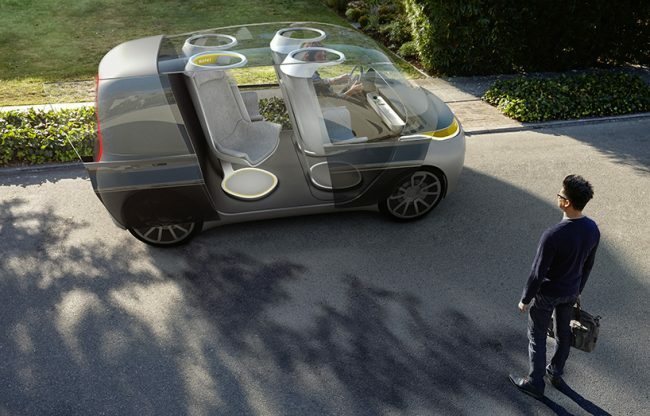 The idea is that you book a shared ride into a communal car with personalized pods, loaded with the latest technology(including privacy mode). Upon arrival at your destination, the communal car doesn’t just rest idle afterwards. Instead it goes onto the next passengers needing a ride somewhere. The biggest space saving potential to this is that cars can be constantly on the move. Just imagine, no more cars parked on idle!!! The privacy pods will also mitigate the social awkwardness of sharing a car with strangers at close proximity. According to IDEO’s vision, the person owning the car gets bit of income too. Yes, certainly there are legal loopholes and unhappy people with such an idea.But in a small city like ours, we should look for more solutions that work in unison with our super efficient transport system. We should look for more positive incentives to share rides. And if we can all embrace this, everyone can actually walk around the city with more room to walk and breathe. The business of sharing is booming, and the irony here is this: Hong Kong was the originators of sharing. I’ve always been amazed by the stories from my parents, uncles and aunties and how they grew up in Hong Kong. Many of their stories revolved around a strong sense of community. So maybe we shouldn’t look at innovation as a means to catching up with the rest of the world. Maybe we should look at innovation and how we can capture the magical atmosphere of Hong Kong’s past. I believe that IDEO’s vision here is one of those things that can take Hong Kong’s past into the future.